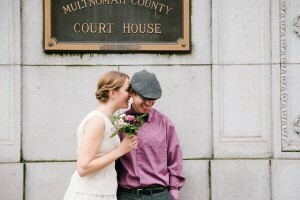 Remember Melinda & Greg’s sweet courthouse elopement in January? A few weeks ago they gathered together their friends and family for an even sweeter ceremony at Wahclella Falls in the beautiful Columbia Gorge, and then hosted us all in their gorgeous and verdant backyard for a Moroccan feast. Hope you enjoy these photos!